Bellefaire began as an orphanage for Jewish children. During the Civil War years, the B'nai B'rith Midwest District accepted a proposal by Clevelander Benjamin Franklin Peixotto that members be taxed a dollar a year to raise a charitable fund. Women from nine cities were also asked to raise money for the fund. In 1867 the District decided to establish a home for Jewish orphans of the Civil War and considerable lobbying led to its establishment in Cleveland. 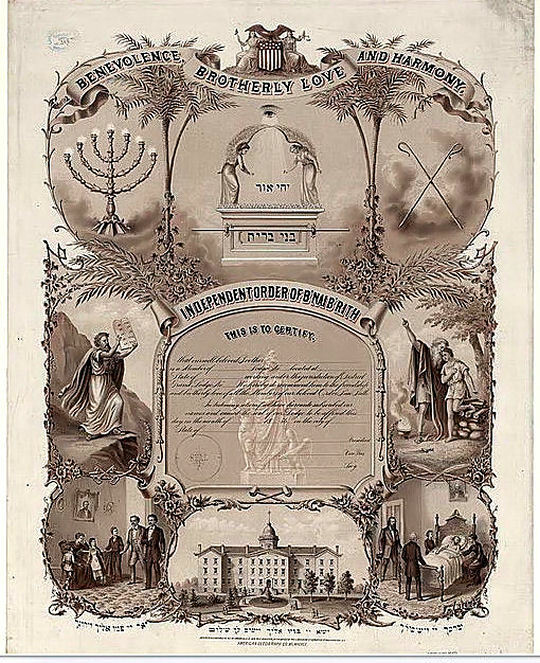 That the orphanage was considered to be a significant benefit of being a member of B'nai B'rith can be seen in this 1876 certificate of membership in B'nai B'rith displayed in a Library of Congress exhibit "From Haven to Home". The building shown at the bottom of the certificate is the orphanage they established in Cleveland in 1868. Jewish Orphan Asylum. in an undated (ca 1900) picture from the Cleveland Press Collection. Online on the Cleveland Memory Project. By 1900 the orphanage, under the direction of Dr. Samuel Wolfenstein, had grown to serve 400 children. 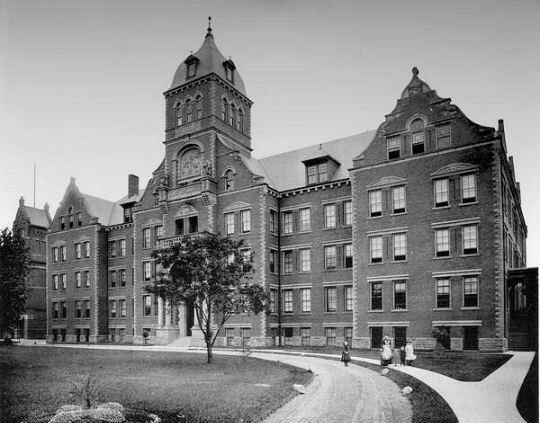 For more on the Jewish Orphan Asylum, view our page created by Gary Polster PhD, author of "Inside Looking Out: The Cleveland Jewish Orphan Asylum 1868-1924." In 1929, now named the Jewish Orphan Home, it moved to Belvoir Road and Fairmount Boulevard in University Heights and adopted a new name: Bellefaire. We hope to expand this page, relying on several sources, notably the memoir of Michael Sharlitt (As I remember: The home in my heart). Sharlitt (1883-1996), who had grown up in a Jewish orphanage, became the superintendent of the Jewish Orphan Home on Woodland near East 51st Street on December 30, 1921. He continued its evolution to a more humane institution that his predecessor Simon Peiser had started. Then he oversaw its move to University Heights in 1929 and remained superintendent of a new cottage-based institution now called Bellefaire. Sharlitt managed its transition to a home for Jewish children he called "psychological orphans" and left in 1941 as it began another change to what it is today - a residential treatment center for emotionally troubled youngsters. Bellefaire's focus changed in 1940 to include residential therapeutic care for emotionally disturbed children. It stopped accepting orphans in 1943 and is now known as Bellefaire-JCB (Jewish Childrens Bureau). In 1954 it opened its doors to children of all faiths. Now Bellefaire-JCB (Jewish Childrens Bureau) it has continued to expand its services to children and teens. Read the Bellefaire-JCB History page. In an arrangement that began in 1976, Cleveland's Jewish archives, including those of The Jewish Orphan Home - Bellefaire, are at the Western Reserve Historical Society. MS 3665 Bellefaire Records. 1868-1972. MS. 4703 Bellefaire Records, Series II. 1868-1983. MS. 5100Bellefaire Records, Series III. 1900-2003. PG. 154 Bellefaire Photographs. 1870-1970. PG. 571 Bellefaire Photographs, Series II. 1867-1995. We've received requests for Bellefaire information from around the globe and are pleased to make it available to researchers interested in Cleveland History and Genealogy topics.